House of Woyaks: Splish, Splash - they love takin' a bath! Well, just one of them does for right now. Though Alex is coming around now. At first Alex HATED baths. HATED. Hated doesn't even begin to explain how he felt about it. I mean, you would think that something horrible was happening to the little guy. But the past few times he's been quite happy. And for this swimmer mama that is goooood news! PHEW! Anyhoo! Bath time is our favorite time of the day. That means bedtime is just moments away. Quiet and peace will once again be restored in the house! So, this week's Toddler Talk is about bath time routines! If you want to join in, check out Crazy About My Baybah! Bedtime around here (due to the stinkin time change) has been moved to 8 now. Andrew realized that at 7 kids were still outside playing. Hello! These were also weeknights. Um, why are those kids not in bed/getting ready for be on a school night anyway? Ok, that and the sun was still kinda up. So, now it is 8pm. And, yes, I do countdown the hours...and minutes until that moment that the bath time routine begins. 7 pm (or whenever dinner ends, but around this time) - Clearing the table and getting prepared! Now, that I'm back to using the infant tub, my kitchen sink area really does have to be cleared. Andrew helps out sometimes with getting everything put away. He likes to fold the placemats :) Cutie pie. Anyhoo! He helps me get Alex's stuff together and then runs as fast as he can behind his Daddy to take a shower with him. And YES! Jason is even asking Andrew if he needs to go potty before and after the shower. We are slowly working on the potty training. But, hey - we are working on it. :) I would love to NOT hit the Size 5 diapers. Size 4 and then no more. It even rhymes. See? It's meant to be. So while Andrew is in the shower, the tiny king of the house is taking his bath. As I said, he really hated it before. But last night, he loved it! He was happy and quiet. Just looking around. But, I kinda cheated...maybe. I sing "Itsy Bitsy Spider" the entire time. And, yep, when I get to the "down came the rain" part, he gets water poured on him. That must be his favorite song. I sang that to him the first time at the yoga class I went to this past Tuesday. So, maybe it really is. Very cool. That's a fun song - you know, with the little hand movements and all. Fun. Wanna see something fun now? 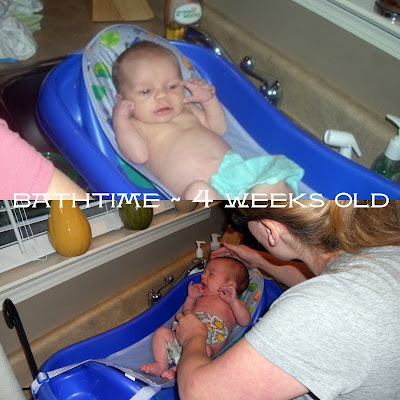 Bath time for my babies - at 4 weeks old. Both of them at 4 weeks old. Who is who? Hmmm? Easy guess. Speaking of favorite songs - do your toddlers have a song (or two) that they just love to hear? lol! the little guy does NOT like the water as much as big brother... this was an easy one! xoxoxo! 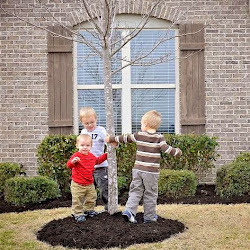 Just wait 'till your 8 year-old is a teen and starts in on what the other kids get to do~hold your ground, mama! Good night & God Bless!